It’s 2010 and cell phones are more than ever an essential part of our everyday lives. With the market becoming heavily penetrated with smartphones, it’s hard for people to find themselves going for more than just a few minutes without having a quick glance at their device for new text messages, checking emails, or just browsing the web. Even with many mobile innovations, a phone can still easily become rendered useless if there’s no signal. Both dropped calls and dead zones are still widespread and common problems. Wilson Electronics, with nearly 40 years of experience, hopes to solve that issue for the average consumer with a lineup of friendly signal boosters. These aim to offer improvements to both voice calls and data transfer speeds for just about every major cellular carrier (except Nextel). We first tested their products in 2008, but found a mixed bag of results. After ruling out the previous units as likely defective, the folks at Wilson Electronics sent us some new units. These signal boosters are the real deal. They aren’t those little stickers from the 1990s that adhered to the back of phones, claiming to improve signal. The technology works by utilizing two antennas. 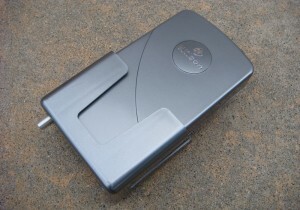 One receives signal from a cell tower site just as your cell phone would, but with a powerful antenna. It then amplifies that signal indoors with the second antenna for better performance. Wilson Electronics offers a variety of cellular signal boosters including the Sleek for a single mobile phone and the MobilePro for multiple devices when in a car, a hotel, or on the go. 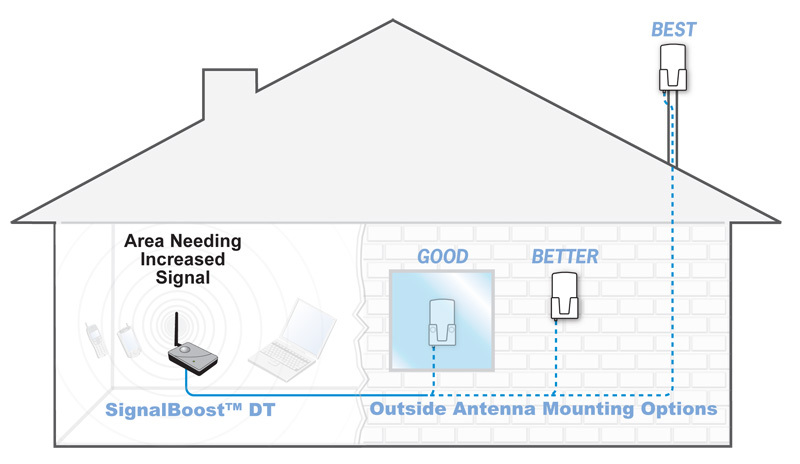 For this review, I’ll be focusing on the SignalBoost DT which aims to offer strong signals for an entire household (~2,000 square feet). Getting the SignalBoost DT up and running is a bit more complicated than the average gadget on the market. It was one of those few times I realized that I would have to actually resort to reading and following directions. At first, I also found the amount of equipment in the packaging a bit overwhelming: the SignalBoost DT Amplifier, an internal Antenna, an external Antenna, coaxial cables, and a power supply. The packaging also included a variety of mounting parts for getting the external antenna to a secured to a wall, a pole, or a window. After a quick skim through the instructions, I began by finding a place to mount the external antenna. Finding a good spot is quite critical. If the antenna can’t find a signal to amplify, it won’t do anything. The ideal positioning would be on top of a household on a pole mount facing the cell tower site. Unfortunately, this isn’t an entirely a practical option for everyone since there’s a certain degree of difficulty involved. Other solutions include mounting it to the wall outdoors or even on the inside of a window facing the general direction of the closest cellular tower. I opted to use suction cups to stick it to a window about 30 feet of the ground on the second story of my home. Next, I had to find a spot in my home for the SignalBoost DT amplifier. Positioning for this device is also essential since it broadcasts the signal indoors. It’s ideal to place this component in the part of a home with the weakest signal or in an area where people generally make calls. I decided to place the device in my dedicated office room. There’s a little mini antenna that connects to the SignalBoost DT and had to have at least 24 inches of separation. 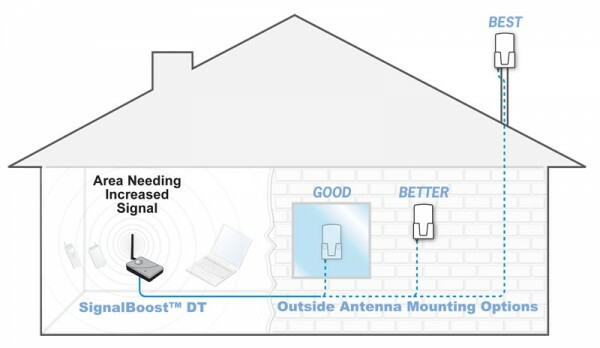 Unfortunately, there was a kicker: the SignalBoost DT amplifier requires a minimum separation of at least 30 feet away from the external antenna that I mounted on a window on the second story. Although my home was large enough that a spacing gap wasn’t an issue, the wiring was difficult. I had to run 50 feet of the included coaxial cable (20 foot + 30 foot combined) from a room on the second story through the hallways, down the stairs, and to my office room. Ideally, if I had the tools, time, and this wasn’t a test unit, I would fish wire through the drywall to keep everything clutter-free. But once again, it’s not something the average person can get done. Installation wasn’t problematic, but it can easily be an obstacle for the average consumer. I should note that if the antennas aren’t positioned properly, it won’t work at all. The system had a fail safe mechanism that automatically turns the amplifier off to avoid disrupting the existing cellular signal. Getting a green status light on the SignalBoost DT equates to optimal performance. An orange light means holds back the amplification to avoid oscillation and a red light means it’s been entirely shutoff. However that being said, it’s only a one-time ordeal. Once wiring is complete and the antennas are secured, you’ll never have to touch the equipment again. Although the setup process was a hassle, the performance was phenomenal. I setup the SignalBoost DT in my home up in the mountains which suffered dropped calls due to poor signal across the board for AT&T, Sprint, and Verizon. There were a few corners of my home that had just enough signal to hold a steady call, but awkward areas aren’t comfortable for anyone. After powering up the SignalBoost DT, within just a few minutes, I knew things had changed. I could comfortable walk around my home with an extra bar or two on various devices maintaining steady calls. 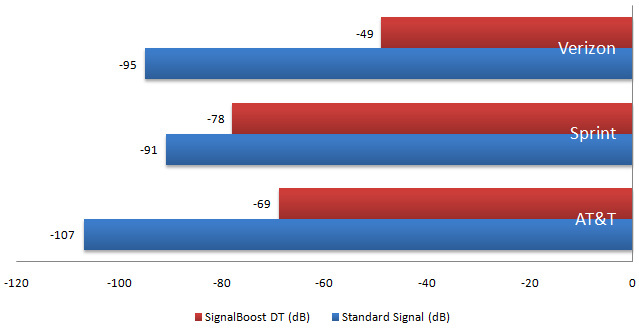 As indicated by the shorter bars, the signal strength with the SignalBoost DT enabled offered great improvements across all three networks. AT&T for instance, was especially notorious for dropped calls. My iPhone could finally hold a steady call with the signal booster. Calls on Verizon Wireless weren’t as much of a problem, but were often hard to hear the other party. With the signal booster, calls on the Motorola Droid sounded louder and clearer. Another noticeable difference across all networks was voice clarity. Prior to signal amplification with Wilson Electronics, voices were a bit choppy and often sounded a bit robotic. With the signal booster enabled, everything sounded smooth and crystal clear. As for data transfer rates, there wasn’t much of a noticeable difference. Download and upload speeds were a tad bit faster with AT&T and Verizon, however a bit slower on Sprint with the same speed test. One thing was clear across the board, with the SignalBoost DT powered up, I could actually comfortable make calls in my home without having to worry about dropped calls or having to resort to using a land-line. The effect of cellular radiation on our brains has been quite a concern in recent years. Many reports have even claimed that using a low-powered Bluetooth headset would help reduce the harmful cellular waves that would be exposed to your brain by distancing a phone from your head. After an interesting conversation with Joe Banos, the COO of Wilson Electronics, I learned some useful information. He pointed out that a cell phone generally emits more radiation when it’s trying to acquire signal, but if it has signal, the radiation would be significantly less. The most harmful radiation is generally when your head is within close proximity of the cellular antenna. 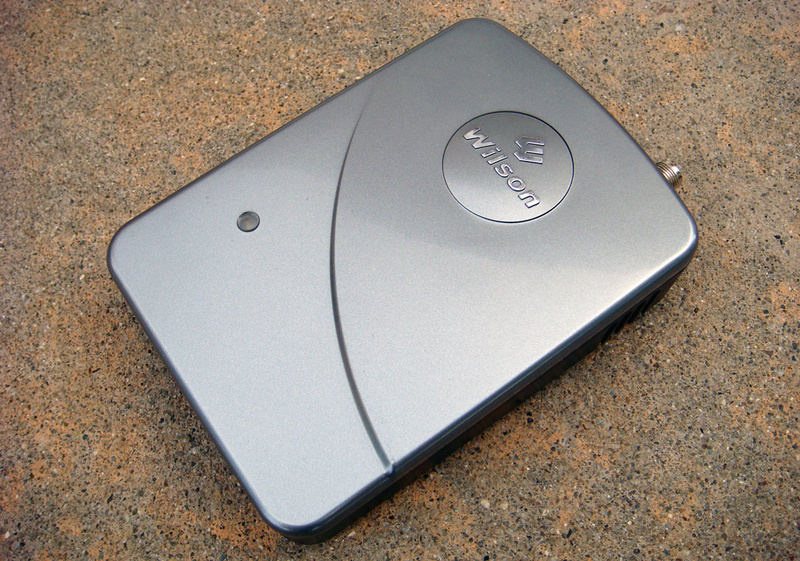 With the Wilson Electronics SignalBoost amplifier doing it’s job, a cell phone actually tones down the internal antenna since it already has signal. However, that being said, the SignalBoost DT amplifier emits a little more power than a WiFi router, which could be unhealthy. For the most part, as long as you don’t have your head besides the signal booster for long durations, you will be just fine. But keep in mind, if you are more than 20 feet away from the booster, it won’t offer much signal improvement, making this a tricky ordeal. Another noticeable and indirect benefit was battery life improvement since a phone won’t have to constantly searching for a signal. I noticed that my iPhone had a lot more battery life towards the end of the day when I was at home. My conversation with Banos also led me to the topic of signal boosters potentially getting banned by the FCC. In recent news, cellular carriers including AT&T and Verizon Wireless have filed claims that boosters were disrupting their networks. According to Wilson Electronics, there have been only about 7 situations over the past 10 years where Wilson Electronics amplifiers had caused issues. In addition, Banos claimed that those were their legacy boosters that didn’t have a fail-safe mechanism. All their new products now automatically shutoff to avoid interference if the amplifier isn’t working properly. Banos also stated that Wilson Electronics has offered to have an open discussion with both AT&T and Verizon to address their concerns, but said that both companies have failed to respond or work with them. He also mentioned that Sprint has been the most “open-minded” of the networks offering to work with them on improving their products and solving those few issues. When it comes down to it, the Wilson Electronics SignalBoost DT does an amazing job of improving cellular signal strength. With the number of cellphone-only U.S. homes growing from just 15% in 2007 to 21% in 2009 according to Nielson, this could be quite helpful for many. Plus, with the number of data-heavy smartphones expected to reach a 40-50% market share in 2010, strong signal is essential. If you live in an area that is plagued with poor signal, this is an excellent solution. The only drawback would be the installation process. Getting the antennas mounted and running the wires through a household is a bit of an obstacle for the average person. Also, the signal booster isn’t exactly cheap. The SignalBoost DT model goes for about $300 on BestBuy.com. It’s definitely an investment, but if you aren’t able to make cell phone calls with your current cellular network and the carrier isn’t doing anything to help, I’d rather spend put my money into Wilson Electronics rather than wasting $350 on an Early Termination Fee (ETF) to leave Verizon Wireless for instance. 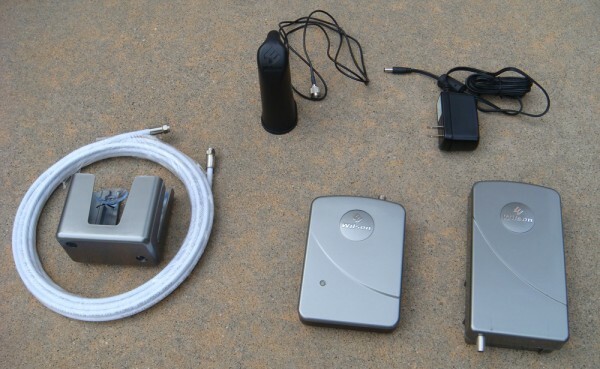 AT&T and Sprint have begun to offer “Femotocells,” which are mini cell-sites that utilize your broadband connection to provide full signal in your home, but these cost about $100-200 plus monthly fees. 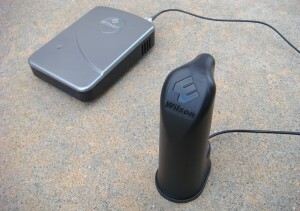 With that in consideration, if you need a signal boost, you won’t be disappointed with the solution Wilson Electronics offers. Do you have a WiFi router at home? It works in a similar fashion. If you laptop is too far away from your router, you may still have an internet connection, but it will be slow. For this SignalBooster, if you are within 20 feet of the internal antenna, you will notice great improvements. (Assuming that the product was setup properly, there isn’t any odd interference, and that the external antenna has a hint of signal to pickup.) If you start getting further and further away from the internal antenna base, the improvements will begin to decrease. Placing it in the center of a 2,000 square foot house will probably yield improvements everywhere, but the affect might be hard to decipher when too far away. In my opinion, if you devices suffer from poor signal, this is a better option than paying AT&T, Sprint, T-Mobile, or Verizon extra each month for one of those “network extenders”. It’s counter-intuitive to pay them extra for poor service and to be slowing down your home network in the process. Thanks for a great review. It helped me in deciding to purchase this product. I live in a rural area, a hundred or so meters from a major highway. On the highway, cell signal is great. Drive off the highway to my place, and the signal drops to one or two bars. I set this system up in my house and placed the external antenna against the wall and immediately got a boost. I could hope for a mobile internet stick signal of about 74 per cent at best, and as I type this, I’ve got a 91 per cent signal rating. I took the external antenna outside and simply placed it on the ground and got an even stronger signal. I can’t wait to elevate it for an even better signal. Bottom line this product rocks. It’s the first time I’ve been able to sit in my recliner and talk on my cell phone without losing a call. This doesn’t mean I’m getting 90 per cent signal strength throughout the house, but the transmitter works effectively enough that I can sit in the next room and talk and the reception is clear. That works for me. I’m sold.